"I'm offended by that" and "I find that offensive" are statements about the person making them. They tell you something about how this person feels. They are not indicators of any sort of objective metric of offensiveness. No such thing exists. They tell us nothing about the likelihood that something is offensive in any absolute sense; they are merely statements about how the person making them feels with regard to what he or she is labeling as offensive. 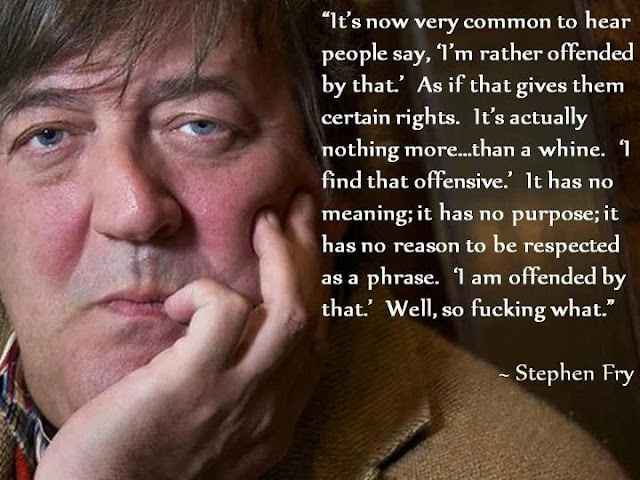 How someone feels about what he or she labels as offensive might be relevant in some situations. And yet, how someone feels when encountering content they regard as offensive is far less important than our right to express ourselves in ways that some will inevitably find offensive. Does that mean that people should have the right to say things that hurt other people's feelings? Yes! We may say things that hurt others' feelings. We must all have the right to say things that some people will regard as offensive. Efforts to suppress the expression of ideas that some regard as offensive are misguided, potentially dangerous, and should be resisted by any society that values freedom of thought and expression. There is nothing wrong with someone freely choosing to attempt to avoid saying things others find offensive; there is a great deal wrong with the exertion of state power or social pressure to punish those who do not choose to do so. We have no right not to be offended; we have no reasonable expectation that we will never experience hurt feelings. Freethought depends on our ability to encounter and engage ideas we find objectionable, even offensive. We must not allow ourselves to be deprived of this opportunity. Your freedom to express yourself is worth far more than protecting me or anyone else from experiencing hurt feelings.